Have you ever wondered what it’s like to breathe underwater. 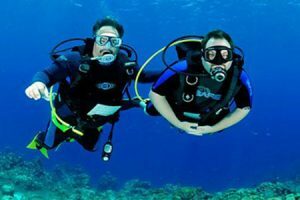 If you want to find out but aren’t quite ready to take the plunge into a certification course, Discover Scuba Diving will let you try scuba to see if you like it. Go West Diving offers you this program on our beautiful house reef nicknamed “Alice in Wonderland”! While not an actual scuba certification, during the Discover Scuba Diving experience you’ll learn how to use scuba equipment in shallow water, get a quick and easy introduction to what it takes to explore the underwater world and then actually go exploring!! All students must read the PADI Discover Scuba® Diving Participant Statement required and complete a PADI Medical Statement prior to participating in any course. Water skills practice in shallow water. 1 shore dive with your instructor to up to 40″(13m) on the beautiful house reef, Alice in Wonderland.